Julio Morban posted his first two triple performance of his career on Tuesday. 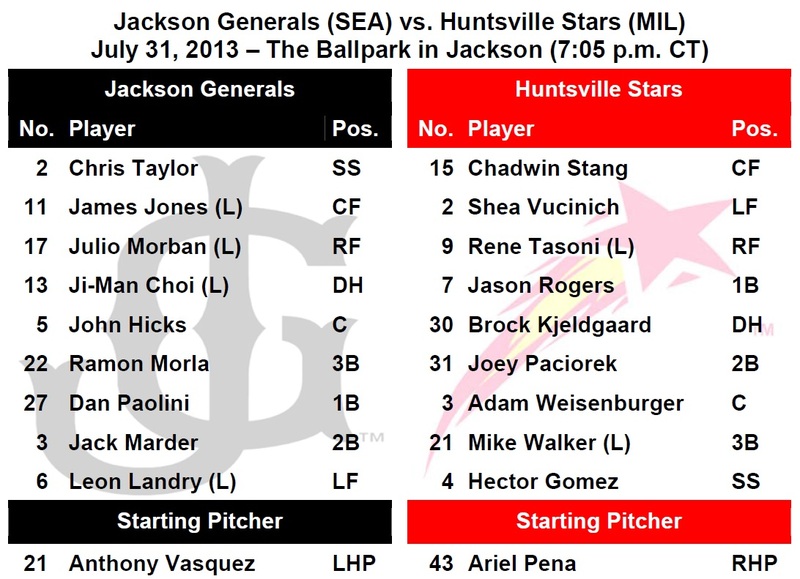 GENERALS RECAP: DH Julio Morban hit 2 triples and drove in 2 runs as Jackson defeated Huntsville 5-1 on Tuesday night. Morban (2×3, 2 R, 2 3B, 2 RBI, BB) and 1B Ji-Man Choi (2×3, 2 RBI, BB) each recorded 3 hits, while CF James Jones (1×4, R, RBI) and C John Hicks (1×2, BB) each recorded 1 of the Generals 6 hits. Starter Anthony Fernandez (7.2,5,1,0,2,4) earned his team-leading 7th win of the season, allowing 1 run (0 ER) on 5 hits in 7.2 innings. RH Dominic Leone (1.1,1,0,0,0,0,3) recorded the final 4 outs, including 3 strikeouts. • INF Ji-Man Choi is batting .368 (14×38) with 3 runs scored, 5 extra-base hits (2-2B, 2-3B, HR), 9 RBI and 6 walks in last 10 games. LHP Anthony Fernandez went 2-2 with a 2.30 ERA (8 ER, 31.1 IP) in 5 starts in July. • LHP Roenis Elias is 2-2 with a 3.22 ERA in the month of July and has 32 strikeouts in 22.1 innings including 18 in his last 10.1 innings pitched. Elias is T-1st in the Southern League with 107 strikeouts. • RH Dominic Leone has tossed 6.1 scoreless innings since being promoted to Jackson from High Desert. He has limited opponents to a .095 average (2×21), while walking 0 and striking out 9 in 5 relief appearances. Dating back to June 16 with High Desert, Leone has tossed 16.2 scoreless innings. NEWS & NOTES: 37 of first 101 games have been 1-run games (15-22) which is the 7th in all of minors…53 of 101 games have been decided by 2-or-fewer runs (19-34) and 12 have been extra-inning games (4-8)…In games decided by 3+ runs the Generals are 26-21. • ALUMNI REPORT: 2011 and 2012 General and current Tacoma utility man Nate Tenbrink currently has an 8-game hit streak for Tacoma, batting .393 (11×28) with 9 runs scored, 1 double, 4 home runs, 9 RBI, 6 walks and 1 stolen base. • GENERALS AT THE TRADING DEADLINE: The Generals have been affected by the trading deadline the last 3 years. Last season Jackson added RHP Logan Bawcom from the Dodgers in the Brandon League deal. In ‘11 Jackson added INF Francisco Martinez and OF Chih-Hsien Chiang in the Eric Bedard trade with Boston. In ‘10 Jackson added INF Matt Lawson, RHP Josh Leuke and RHP Blake Beavan in the Cliff Lee deal with the Rangers. • WELCOME BACK JOE: OF Joe Dunigan was activated to Jackson’s roster Monday after missing 3 months with a broken jaw. Dunigan ranks 3rd in Jackson franchise history with 42 home runs and 4th in RBIs with 144. 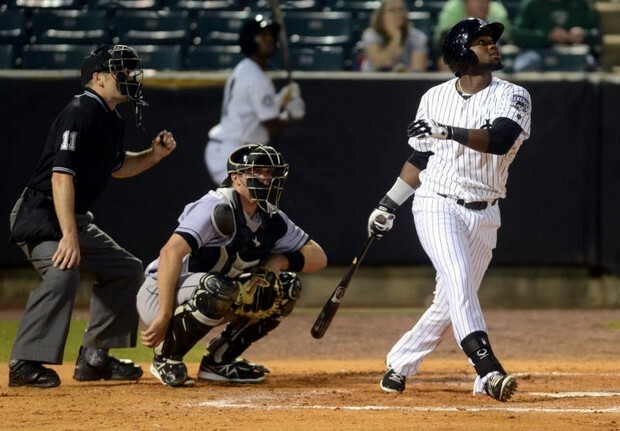 • TRIPLES ADDING UP: OF James Jones recorded his league-leading 10th triple last Wednesday in Chattanooga. He is 1 triple away from tying the franchise record. Jones is tied with Richard Lewis (10, ‘04) and Chris Walker (10, ‘06). Dwaine Bacon (11, ‘04) and Bo Porter (11. ‘98) are leaders. As a team the Generals have 33 triples which is 2nd-most in the Southern League. • THE HOME STRETCH: The Generals are in the midst of playing 42 games in 42 days that started on July 23 to close out the regular season. 27 of those games will come on the road and 15 at The Ballpark in Jackson. Jackson’s next off day is scheduled for August 12. • WE GOTCHA! !…Jackson catchers lead the SL catching 52.8% of base stealers (56 CS, 106 Att). The next closest is Birmingham which is throwing out 33.9% of base runners.